High Voltage is the must-see rock event of 2010 - a two-day festival featuring the very best in classic rock, progressive rock and metal, with over 40 acts hand-picked by the UK's fastest-growing music magazine, Classic Rock. Topping the bill are the legendary Emerson, Lake & Palmer and ZZ Top with many more acts to be announced. Emerson, Lake & Palmer are reuniting especially for High Voltage. This will be ELP's one and only live performance of 2010 - and possibly the last show they will ever play together, the culmination of a spectacular career that has seen the trio sell over 30 million albums worldwide. 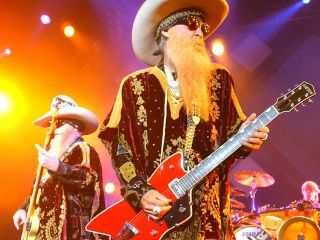 This marks the first time that ZZ Top will be headlining a UK rock festival in 25 years. The superstar trio, known far and wide as that little ol' band from Texas, are celebrating their 40th year with the same personnel intact. The group has sold in excess of 40 million albums over the course of a career that saw them inducted into the Rock And Roll Hall Of Fame by The Rolling Stones' Keith Richards in 2004. The Birmingham Mail cited their recent Wolverhampton appearance as "a barnstorming boogie blitz that pretty much blew the roof off the Civic Hall." Says Classic Rock Editor-in-Chief Scott Rowley: "High Voltage is the festival all true rock fans have been waiting for - custom built by rock fans for rock fans. The High Voltage team have been to every rock festival imaginable - we're taking what we've learned to build a festival unlike any other. "First of all there's the music: two amazing headliners AND three unique stages specially curated to cater for different sides of the rock audience, and a brilliant supporting cast playing special must-see sets. "Then there's the festival itself. The facilities will be second to none: great food, proper beer, clean toilets, deluxe hospitality packages, designated hotels, free shuttle transport. This is somewhere you take the whole family." High Voltage offers a new and unique festival experience for rock fans of all ages. Only High Voltage gives ticket buyers the freedom to design their own bespoke festival package - which can include accommodation, transport, parking and VIP bar access. Early bird ticket purchasers will be able to upgrade their tickets with a host of options from January 2010. "If you can think it up, we can do it," says Scott Rowley. "We asked our readers what they'd like to see and we're taking the best of their ideas and making them happen. It's 30 years since the first Monsters Of Rock festival, and now, at last, rock fans have finally got a quality festival they can call their own." Early bird tickets priced £120 (for weekend tickets) and £65 (for day tickets) will be on sale from 9am on Friday 4 December 2010. The early bird tickets will end on 31 December 2009. Standard tickets are prices £130 (for weekend tickets) and £75 (for day tickets).